The Mayor of the City of Los Angeles is the official head and chief executive officer of Los Angeles, California, United States. The officeholder is elected for a four-year term and limited to serving no more than two terms. Under the Constitution of California, all judicial, school, county and city offices, including those of chartered cities, are nonpartisan. Eric Garcetti has been the city's 42nd and current mayor since 2013. Calvert is a city in Robertson County, Texas, United States. As of the 2010 census, the city population was 1,192. It is located approximately halfway between Waco and Bryan-College Station at the intersection of Texas State Highway 6 and Farm to Market Roads 1644 and 979, on the Southern Pacific line nine miles north of Hearne in west central Robertson County. For the last 35 years, Calvert has enjoyed a relative success as an antique "capital". The town is named for Robert Calvert, an early settler who served in the Texas Legislature representing Robertson and Milam Counties. John H. Francis Polytechnic High School is a secondary school located in the Sun Valley neighborhood of Los Angeles, California, United States. It serves grades 9 through 12 and is a part of the Los Angeles Unified School District. Despite its name, Polytechnic is a comprehensive high school. Kappa Alpha Psi (ΚΑΨ) is a collegiate Greek-letter fraternity with a predominantly African-American membership. Since the fraternity's founding on January 5, 1911 at Indiana University Bloomington, the fraternity has never limited membership based on color, creed or national origin. The fraternity has over 160,000 members with 721 undergraduate and alumni chapters in every state of the United States, and international chapters in the United Kingdom, Germany, South Korea, Japan, United States Virgin Islands, Nigeria, South Africa, and The Bahamas. Fraternities and sororities, or Greek letter organizations (GLOs) are social organizations at colleges and universities. A form of the social fraternity, they are prominent in the United States, with small numbers of mostly non-residential fraternities existing in France, Canada, and the Philippines. Similar organizations exist in other countries as well, including the Studentenverbindungen of German-speaking countries. Leimert Park is a neighborhood in the South Los Angeles region of Los Angeles, California. Developed in the 1920s as a mainly residential community, it features Spanish Colonial Revival homes and tree-lined streets with a central commercial area and an eponymous park that has remained central to the community. It has become the center of both historical and contemporary African-American art, music, and culture in Los Angeles. His entry into politics came when he decided to become the president of the United Club. The club was part of the California Democratic Council, a liberal, reformist group organized in the 1950s by young Democrats energized by Adlai E. Stevenson's presidential campaigns. It was predominantly white and had many Jewish members, thus marking the beginnings of the coalition, which along with Latinos, that would carry him to electoral victory so many times. His choice of a Democratic circle also put him at odds with another political force in the African American community, representatives of poor, all-black areas who were associated with the political organization of Jesse M. Unruh, then an up-and-coming state assemblyman. The early stage of Bradley's political career was marked by clashes with African American leaders like onetime California Lieutenant Governor and former U.S. Representative Mervyn Dymally, an Unruh ally. Tom Bradley speaking at AIDS Walk LA at the Paramount Studios lot in 1988. During Bradley's tenure as mayor, Los Angeles saw the 1974 shootout with the Symbionese Liberation Army, Kiss' footprints outside Grauman's Chinese Theatre on February 20, 1976, Bradley's handprints there the following year on May 18, 1977, the Hillside Stranglers crime sprees from October, 1977-February, 1978, the end in 1978 of Edward M. Davis's career as one of the Los Angeles Police Department's controversially outspoken police chiefs and, after Assistant Chief Robert F. Rock's brief interim term, the rise of Daryl Gates as their longer-lasting-and also controversial-successor in 1978, Jimmy Carter's 1978 first and 1979 second presidential visits, Bradley's signing of the city's first homosexual rights bill in 1979, the city's bicentennial and the city as the first U.S. one where the discovery of symptoms of what would later be called AIDS was reported in, both in 1981, President Reagan's and Queen Elizabeth II's 1980's visits, ex. both heads of states' debuts were in 1983, the hosting of the 1984 Summer Olympic Games, Los Angeles surpassing Chicago as the second most populous city in the country, Bradley's signing the city's-and maybe the U.S.'s-first anti-AIDS-discrimination bill in 1985, since Los Angeles was/is one of the original top 3 highest reporting cities for it along with New York and San Francisco as well as the first city where its symptoms were discovered in and reported from before the term was coined, increased homelessness, crack cocaine and related gangs during the later 1980s and early 1990's, as well as road rage freeway shootings in the late 1980's when the term was first coined, and welcoming Pope John Paul II in 1987. The Rodney King videotaped incident in 1991 and 1992 Los Angeles riots — in which some critics said Bradley might have "actually made the already tense situation that much worse"  — and the formation of the Christopher Commission also occurred on his watch as did the city-held federal trials in 1993 of the four LAPD officers charged in Rodney King's beating and federal convictions of two of them-Stacey Koon and Laurence Powell-that April 16. Although Bradley was a political liberal, he believed that business prosperity was good for the entire city and would generate jobs, an outlook not unlike that of his successor, Riordan. For most of Bradley's long administration, the city appeared to agree with him. But in his fourth term, with traffic congestion, air pollution and the condition of Santa Monica Bay worsening, and with residential neighborhoods threatened by commercial development, the tide began to turn. In 1989, he was elected to a fifth term, but the ability of opponent Nate Holden to attract one-third of the vote,  despite being a neophyte to the Los Angeles City Council and a very late entrant to the mayoral race, signaled that Bradley's era was drawing to a close. Other factors in the waning of his political strength were his decision to reverse himself and support a controversial oil drilling project near the Pacific Palisades and his reluctance to condemn Louis Farrakhan, the Black Muslim minister who made speeches in Los Angeles and elsewhere that many considered anti-Semitic. Further, some key Bradley supporters lost their City Council reelection bids, among them veteran Westside Councilwoman Pat Russell. Bradley chose to leave office, rather than seek election to a sixth term in 1993. Courken George Deukmejian Jr. was an American politician who was the 35th Governor of California from 1983 to 1991 and Attorney General of California from 1979 to 1983. Deukmejian was the first and so far the only governor of Armenian descent of a U.S. state. Samuel William Yorty was an American politician from Los Angeles, California. He served as a member of the United States House of Representatives and the California State Assembly, but he is most remembered for his turbulent three terms as the 37th Mayor of Los Angeles from 1961 to 1973. The colorful "Mayor Sam" earned numerous nicknames from both admirers and detractors, such as Travelin' Sam, Airplane Sam, Shoot-From-the-Lip Sam, the Maverick Mayor, Mad Sam Yorty, Scrappy Sam, Suitcase Sam, Saigon Sam, and the Reform Republican. Richard Joseph Riordan is an American investment banker, businessman, and politician who served as the 39th Mayor of Los Angeles, California serving from 1993 to 2001. He is a member of the Republican Party. To date, Riordan remains the most recent Republican to serve as Mayor of Los Angeles. Nathaniel N. "Nate" Holden is a Los Angeles County politician who served four years in the California State Senate and 16 years on the Los Angeles City Council. Rosalind Wiener Wyman is a California Democratic political figure who was the youngest person ever elected to the Los Angeles City Council and the second woman to serve there. She was influential in bringing the Brooklyn Dodgers from New York to Chavez Ravine, Los Angeles. Robert M. Wilkinson was a political figure and lobbyist in the San Fernando Valley in California. He was a member of the Los Angeles City Council from 1953 to 1957 and from 1967 to 1979. John S. Gibson Jr. (1902–1987) was a powerful San Pedro, California, politician who was on the Los Angeles City Council for thirty years between 1951 and 1981. He was the president of the council for sixteen of those years and was acting mayor when the mayor was out of the city. Earlier, fresh out of college, he was mayor of a small town in Kansas, the youngest at age 21 ever to serve in the entire country to that time. Billy G. Mills is a retired Los Angeles Superior Court judge and a former Los Angeles City Council member, serving from 1963 to 1974. He was one of the first three African-Americans elected to the council. Joseph E. Hollingsworth (1908–1975), who went by Joe E. Hollingsworth, was appointed in 1961 to replace Charles Navarro as Los Angeles City Council member for the racially mixed 10th district. He served for two years until he was ousted by retired policeman and future mayor Tom Bradley. He was the last Caucasian council member from that district. C. Lemoine Blanchard (1910–86) was a businessman who was a member of the Los Angeles City Council from 1959 until 1963 and a board member of the national YMCA. Edmund D. Edelman was an American politician. He was a member of the Los Angeles City Council from 1965 to 1974 and the Los Angeles County Board of Supervisors from 1975 to 1994. He was known as an "unabashed liberal" with strong Democratic Party support. The 1982 California gubernatorial election occurred on November 2, 1982. The Republican nominee, Attorney General George Deukmejian, narrowly defeated the Democratic nominee, Los Angeles Mayor Tom Bradley. Incumbent Governor Jerry Brown did not seek reelection to a third term. Karl L. Rundberg was an American businessman and politician. He was notable as a Los Angeles City Council member between 1957 and 1965. He was convicted of accepting a bribe in 1967 when a member of the city's Harbor Commission and was placed on probation. The conviction was reversed by a higher court. The Bradley effect is a theory concerning observed discrepancies between voter opinion polls and election outcomes in some United States government elections where a white candidate and a non-white candidate run against each other. The theory proposes that some voters who intend to vote for the white candidate would nonetheless tell pollsters that they are undecided or likely to vote for the non-white candidate. 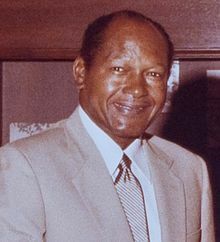 It was named after Los Angeles Mayor Tom Bradley, an African-American who lost the 1982 California governor's race despite being ahead in voter polls going into the elections. Omar Bradley is an American politician who served as mayor of Compton, California from 1993 until 2001. Ransom M. Callicott was president of the National Restaurant Association, co-founder of Meals for Millions and a member of the Los Angeles, California, City Council from 1955 until his death. He was one of the doubters of the proposal to bring the baseball Dodgers from Brooklyn and install them in a new stadium in Chavez Ravine, insisting upon carefully examining the plans for the stadium before it was built. John P. Cassidy was a newspaperman and public relations practitioner who became a Los Angeles City Council member in District 12 between 1962 and 1967. Before and after his term he was a field deputy to two City Council members, and in 1967 he was briefly the head of public relations for the city's Recreation and Parks Department. James B. Potter Jr. was a Los Angeles, California, City Council member between 1963 and 1971. A sales manager for a tool company, when elected to the City Council he became its youngest member at age 31. He was defeated in 1971 amid controversy over development of a housing tract in the Santa Monica Mountains. ↑ Boyarksy, Jean Merl, Bill. "From the Archives: Mayor Who Reshaped L.A. Dies". latimes.com. Retrieved 2018-04-09. ↑ Carter, Jimmy (May 5, 1979). "Los Angeles, California Remarks at Dedication Ceremonies for La Placita de Dolores de Los Angeles". American Presidency Project. ↑ Rick Orlov, "L.A.'S `GENTLE GIANT' REMEMBERED." Daily News, found at The Free Library website. Accessed September 15, 2009. ↑ "11-02-1982 Election". JoinCalifornia. 1982-11-02. Retrieved 2017-04-29. ↑ "11-04-1986 Election". JoinCalifornia. 1986-11-04. Retrieved 2017-04-29. Wikimedia Commons has media related to Tom Bradley (politician) .